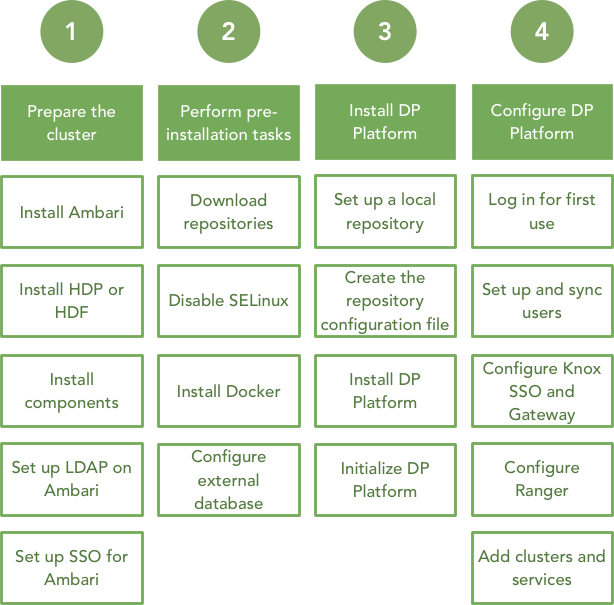 DP Platform and its associated DP Apps are installed on a single host. The DP Platform and the DP Apps run as a set of “containers” on Docker on this host. It is recommended to have this as a dedicated host distinct from other software or cluster hosts. Let us refer to this host as your DP Instance (or “DP Host”). Hosts from clusters that you plan to register into DataPlane must be accessible from this host. The hostname of a cluster node must be DNS addressable from the DataPlane host. In addition, for any DP Apps you plan to use with these clusters, you must install the requisite Cluster Agent for that DP App (for example: DLM Engine or DSS Profiler). Be sure your clusters meet the hardware and software requirements for that particular Agent. See the DataPlane Support Matrix and the support matrix for each of the DP Apps that you want to install.